As a company that prides itself on its awards and accomplishments, you can trust that Cheryl Echevarria of Echevarria Travel will help you plan a truly unforgettable trip. All you need to do is give her a call and she'll take care of the rest. Cheryl Echevarria, who is a dedicated professional has the experience and is ready, willing, and able to work with you. 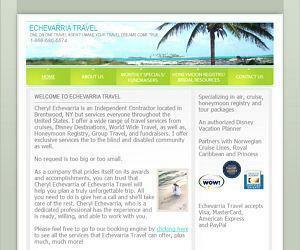 Please feel free to go to our booking engine on our website to see all the services that Echevarria Travel can offer, plus much, much more! Being your travel professional, I am dedicated to finding you the best deal out there. Nothing makes a vacation better than knowing that your personal, experienced travel professional is here to ensure that everything goes smoothly. My husband and I visited Cheryl to set up an anniversary trip. At first we were planning on a cruise to the Caribbean, but when she started showing us options, we switched tracks several times before finally deciding on a cruise to the Mediterranean instead. She was wonderfully patient with all of our indecision. If I had been in her shoes, it probably would've driven me crazy! But she was super nice, and definitely is an expert in what she does. She knows so much about so many different locations it is truly amazing. Our cruise was wonderful--one week on the Med with plenty of great stops in Greece and Italy. We loved every day and will cherish every minute--I so hope we can go again soon! When we finished high school, we were in desperate search of a fun cruise that would not cost us a fortune to go on with. We attended the Echevarria Travel and informed them of our budget and desire to go on a cruise. They did a lot of research and some time later they came up with the perfect holiday package. We went around the Carribean islands and we had everything covered within the money that we had given. It was one of the most wonderful holidays ever, we had the time of our life and we did not come back broke. They are really helpful at Echevarria Travel, I will definitely turn to them again whenever I need them. Cheryl helped me book a cruise for my parents 50th wedding anniversary. My brother and I really wanted to make the trip a special one, and she really made it happen. My parents had a great time on their trip, and now I'm jealous so will most likely book a trip for myself in the very near future. Cheryl helped my spouse and I to book a tour to the Bahamas on a cruise ship. I'm in a wheelchair as of one year ago, and I was intimidated at the thought of planning a vacation in one, but she did an amazing job helping us to find accessible services and accommodations as well as activities which we could both enjoy. We're indebted to them for helping us to organize an enjoyable vacation which we'll remember forever. Next time we plan any sort of trip, we're coming right back for more advice. Do you have any experience using Echevarria Travel? If so, please rate your experience and let others hear about it using the form below.